The Tenth Doctor installed a system that allowed him to lock the TARDIS remotely using a key remote (as a joke, the TARDIS roof light flashed and a alarm chirp sound was heard, similar to that used on vehicles on Earth). In TARDIS v3.0-beta-1 and later, you can craft a remote key to do this too. In plugins version < v3.2.8, the recipe will show a GOLD_NUGGET — you will actually have to use a crafted TARDIS Key. NOTE: If you have changed the item that crafting the TARDIS Key gives (i.e. it is NOT a GOLD_NUGGET), then make sure you also update the TARDIS Remote Key recipe so that the GOLD_NUGGET/TARDIS Key ingredient is also changed. Not only does the remote key deadlock and unlock the Police Box door, but it also allows you to show and hide the TARDIS as well. To remotely lock and unlock the door, LEFT-click AIR with the TARDIS Remote Key. You will hear a ‘car alarm chirp’ and the TARDIS lamp will turn off an on. 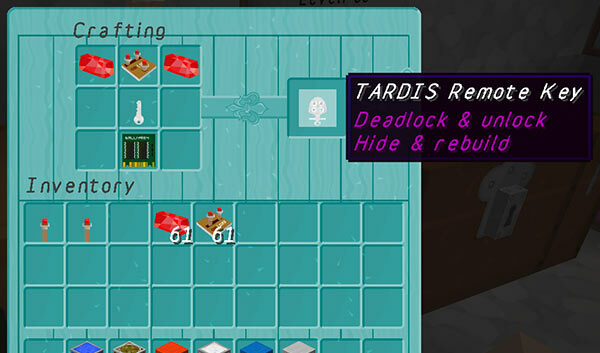 To remotely hide and rebuild the TARDIS, RIGHT-click AIR with the TARDIS Remote Key. You must have sufficient Artron energy (and the correct permissions).